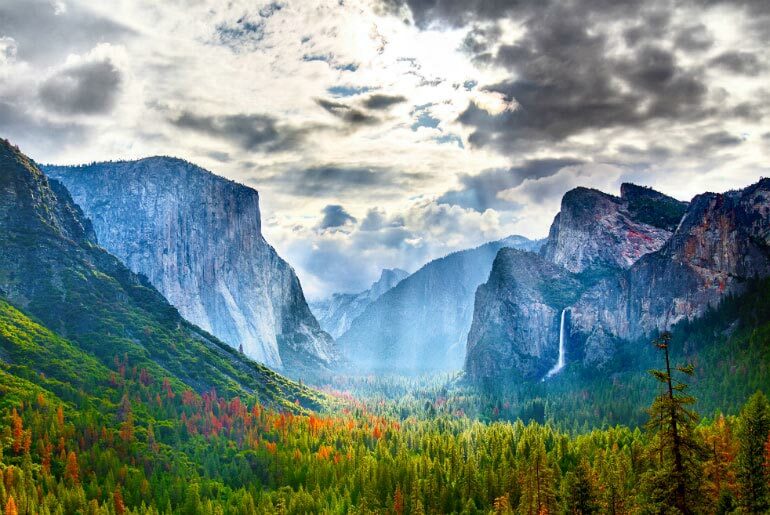 The Best National Parks in The USA Written by Mark Smith. Published on 20th November, 2017 . As the third largest country in the world, The USA has such a diverse range of climate and terrain that their natural environments have created some of the most mesmerising and enticing landscapes on the planet. The interesting thing is that with such a large area, and with such a number of high profile landmarks, most would be mistaken to think that the country has more national parks than the 59 that are currently recognised. Covering a large part of Mt Desert Island on the coast of Maine, the early mornings at the top of Cadillac Mountain can get a little crowded as people strain for the first rays of sunshine. 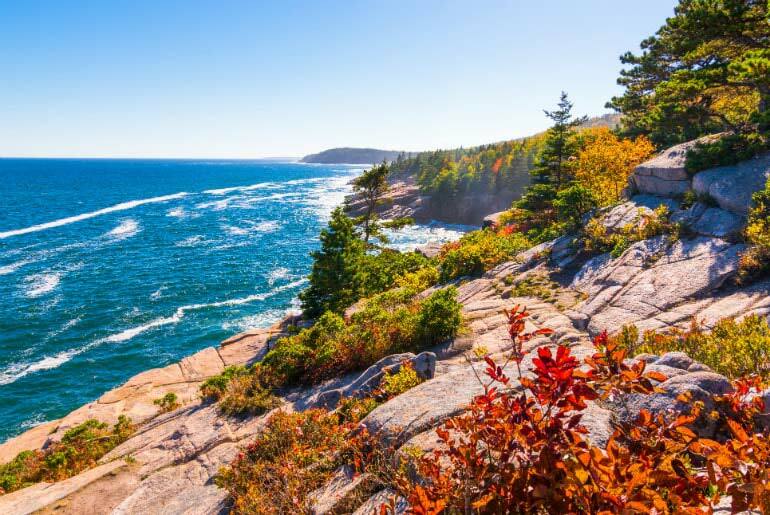 Although not officially the first place in the USA to catch the sun, the views over the Atlantic Ocean are unbeaten, and once the sun is up, the jagged mountains, pine forests, and rocky coastlines are just waiting to be explored. Insider’s Tip: Although driving the 20 mile long Park Loop Road will give amazing views, make sure to experience some of the 125 miles of walking trails, 57 miles of carriage roads, and even get out on the water to see seals and the chance of whales. The most visited national park in the country, the Great Smoky Mountains welcomes over 11 million visitors a year… and it’s easy to see why! 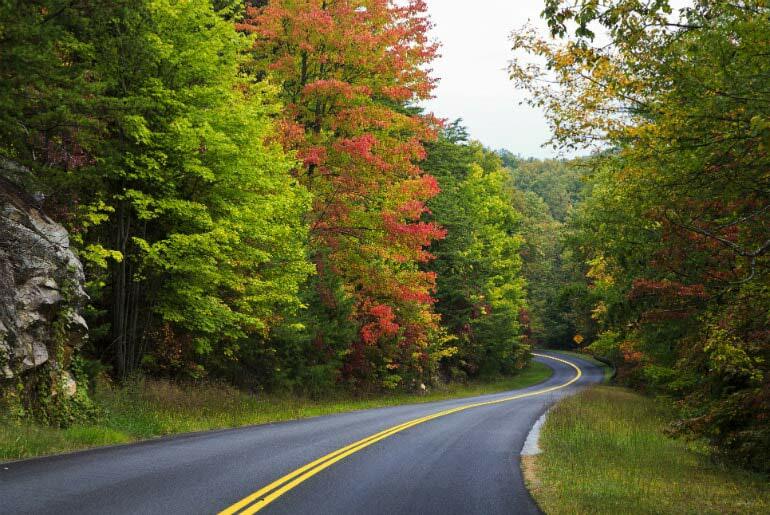 Wildflowers in Spring, hiking trails to spectacular viewpoints in Summer, and some of the best Autumn colours outside of the northeast, the Blue Ridge Parkway is one of the iconic drives in the world. Stretching from Cherokee in the south to I64 in the north, it covers nearly 500 miles before becoming Skyline Drive and continuing through Shenandoah National Park at the northern end of the Blue Ridge Mountains. Insider’s Tip: Accommodation along the Parkway can include characterful plantation homes up to grand manors including the Inn on Biltmore Estate, owned by the Vanderbilt dynasty and to this day, America’s largest home. 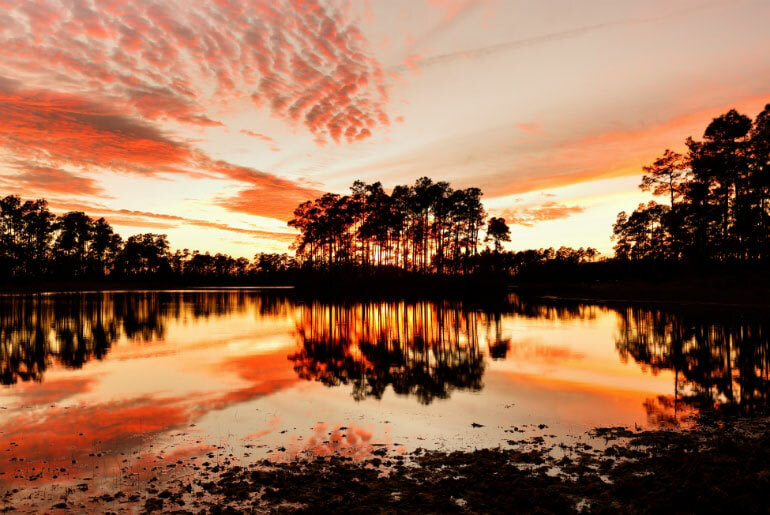 The country’s 3rd largest national park at around 1.5 million acres seems a bit lack lustre to most on first impressions, but the impressive thing about this southern area of Florida is not the mangrove swamps and freshwater marshes, but rather what lies amongst them. Teeming with wildlife, in the air, the land, and the waters, the most famous, the alligator, is almost guaranteed to be seen. Others such as the manatees and panthers are a little harder to find, but keep your eyes peeled as they are there! Insider’s Tip: Although areas can be seen by road and foot, the best way to see the wildlife in this warren of shallow rivers and swamps is on an airboat. A national park consisting mainly of water, the Dry Tortugas National Park liles 70 miles to the west of Key West at the end of the Florida Keyes. 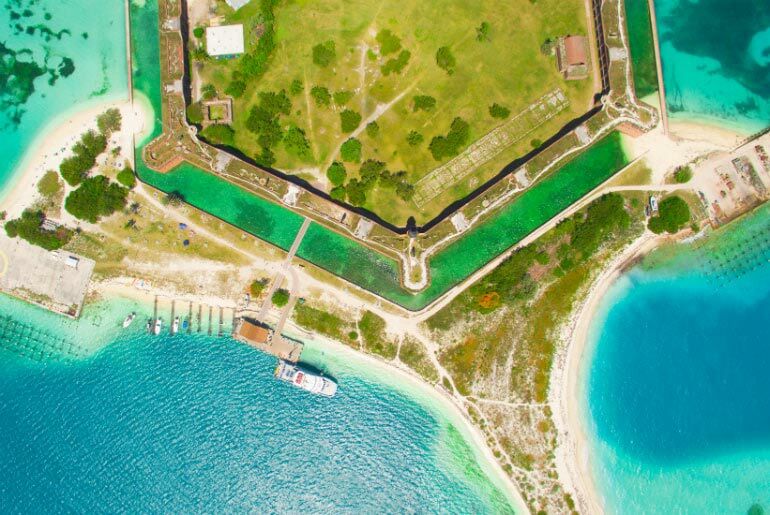 Accessible only by ferry, private boat, or seaplane, and with no fixed accommodation, the cluster of 7 islands contains one of the country’s largest 19th Century forts, Fort Jefferson, complete with imposing seawalls. Famous for it’s surrounding marine life, the coral reefs are also littered with multiple shipwrecks making this a diver’s paradise! Insider’s Tip: The remains of an 1875 ship, Windjammer Wreck off Loggerhead Key is one of the many popular dive sites withing the national park. 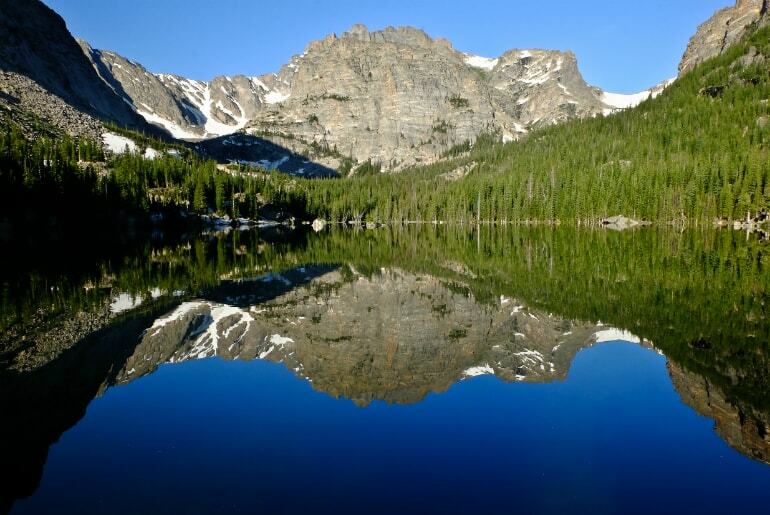 The wild and rugged Rocky Mountain National Park attracts visitors all year round, with 359 spectacular hiking trails in varying degrees of fitness level. The western portion contains lush greenery while the eastern half is arid mountainous terrain that is dotted with countless lakes and streams. During the warmer months, the 48 mile long Trail Ridge Road gives inspiring views of some of the 60+ peaks that reach over 12,000 feet while taking drivers on a twisting and vertigo inducing ride. This national park is also one of the best places to see some of the country’s mountainous wildlife, including moose, bighorn sheep, and elk! Insider’s Tip: A visit during the winter months means road closures and limited access, but its proximity to ski resorts such as Vail and Breckenridge also creates appeal. 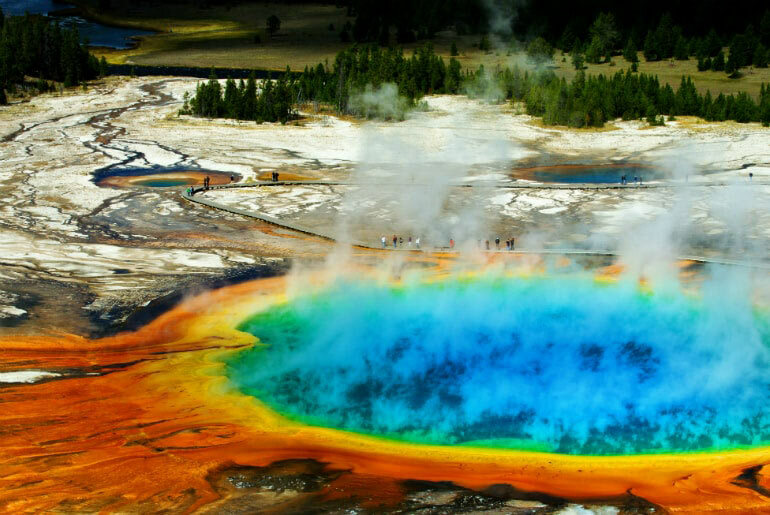 Quite possibly the most famous national park in The USA, and also the first area called a national park in the world, Yellowstone is a sight to behold. With forests, lakes, canyons, and over 10,000 thermal features such as hot springs and geysers, it is easy to see why the area was chosen to be protected in 1872. Known as “America’s Serengeti” due to the sheer number of animals roaming wild, you always stand a good chance of seeing moose, bison, elk, and even a bear. To the south of Yellowstone lies Grand Teton National Park, a deep valley filled with herds of bison and elk, surrounded by dramatic mountains, making this area of the country truly wild and unrestrained. Insider’s Tip: Highlights include Old Faithful erupting every 35-120 minutes, and the Grand Prismatic Spring, but for something really exciting, join a tour and go looking for wolves who have only recently started repopulating in the area! True to its name, Glacier National Park still contains 25 active glaciers, with Grinnell and Sperry Glaciers accessible along a scenic walks.  But this national park also has a multitude of other striking scenes for you to behold thanks to the continental divide that has caused it. 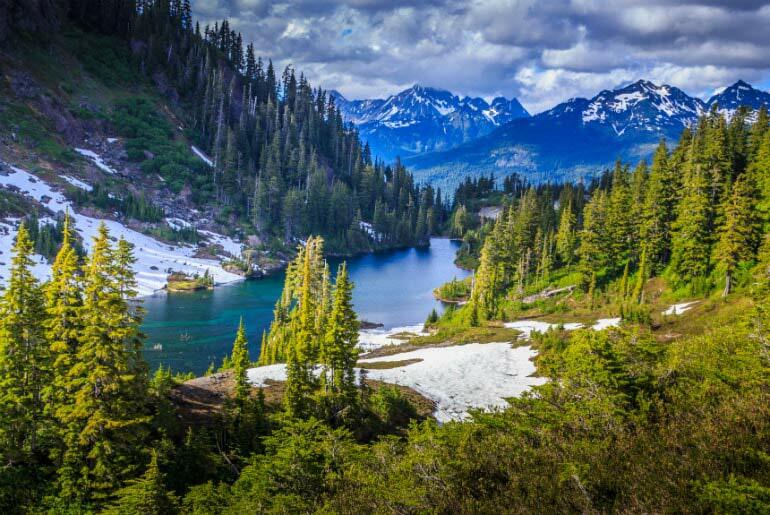 Stark peaks rising over alpine lakes, waterfalls cascading along rocky streams, wildflower displays to rival the best in Spring, and a scenic route that will make you gasp and sweat at the same time, the 50 mile long Going To The Sun Road. Insider’s Tip: If driving on the edge of cliffs isn’t your idea of an adventure, get someone else to do it for you. 1930’s roll-top buses known as Red Jammers mean you can just sit back and enjoy the view! 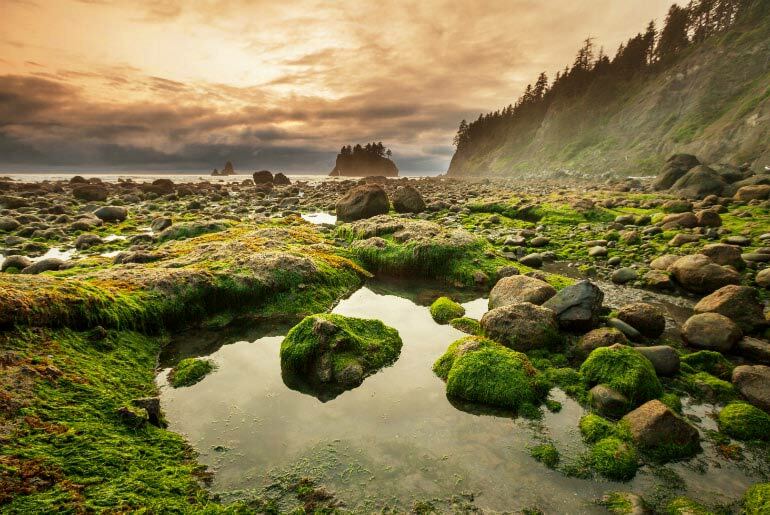 The only rainforest in continental USA, Olympic National Park receives over 12 feet of rain every year making a moss and lichen covered, fern rich, and waterfall dense region on Washington’s west coast. But that’s not all this amazing corner of the country offers visitors, with high alpine meadows that brim with wildflowers during spring, and driftwood strewn beaches with rocky headlands that are just perfect for sunsets. In comparison, Mt Rainier National Park, with its namesake looming over the urban areas south of Seattle, combines snow activities in the winter with over 260 miles of hiking trails in the summer. With several volcanoes within its boundaries, and the infamous Mt St Helens just to the south, this is nature at its grandest! Insider’s Tip: Ruby Beach in Olympic National Park is unbeatable for a sunset picnic after a day of exploring the Hoh Rainforest. Keep an eye out for passing pods of whales! Red rock and blue skies make for some of the most photographed formations in The USA. 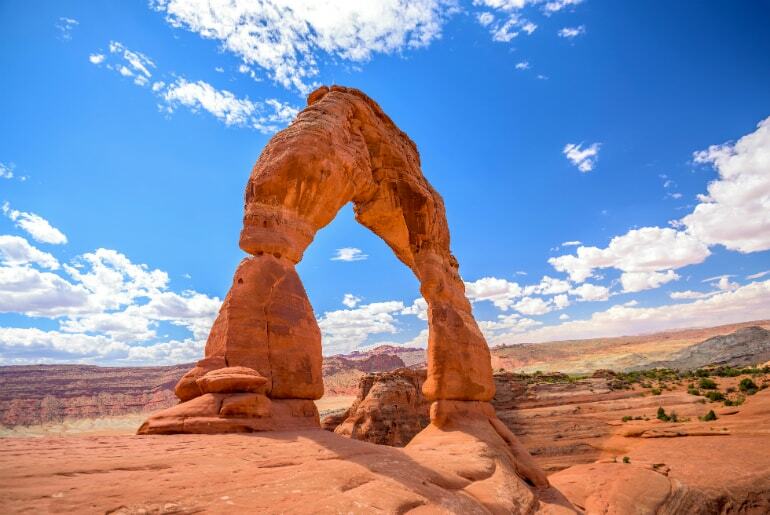 The name means you know just what you will discover at Arches National Park, with over 2,000 stone arches as well as thin fins, towers, bridges, balanced rocks, and spindly needles. Made famous in movies such as Thelma & Louise and Indiana Jones, there are many trails ranging in length to explore this other-worldly landscape. Insider’s Tip: By far the best example of these majestic arches is the towering “Delicate Arch” standing 60 feet tall! Two very different national parks close together in Southern Utah, Bryce Canyon National Park features some of the strangest formations in the world, hoodoos that stand tall from the amphitheatre floor. With thousands of these spires clustered together, the trails winding through the amphitheatre provide a surreal experience, and have given it the name “The Silent City”. 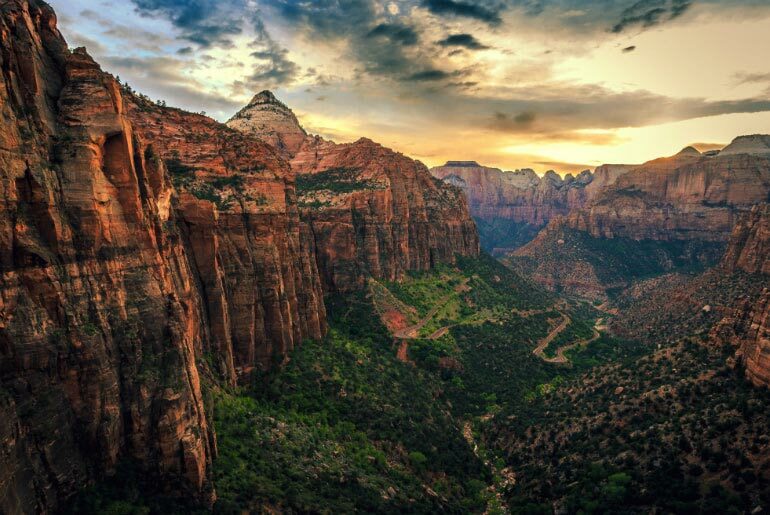 Zion National Park in comparison is focused around a shaded canyon with unbelievably steep walls chiselled by the path of water. With a lush green paradise at the base of the 2,000 foot sheer sides, and trails either along the river and flat valley floor or winding up the walls to lookouts with stunning vistas, this park inspires painters, poets, and adventurers alike. Insider’s Tip: Stargazers flock to Bryce Canyon National Park every year for some of the best stargazing in the world. A UNESCO World Heritage Site and one of the 7 Natural Wonders of the World, the Grand Canyon should be on everyone’s bucket list, and although you will have seen countless photos and documentaries, it will still strike awe and leave you speechless. The South Rim with its visitors centre is where most take in the vistas of this 1 mile deep canyon as well as the wandering wild animals that graze on its edge. 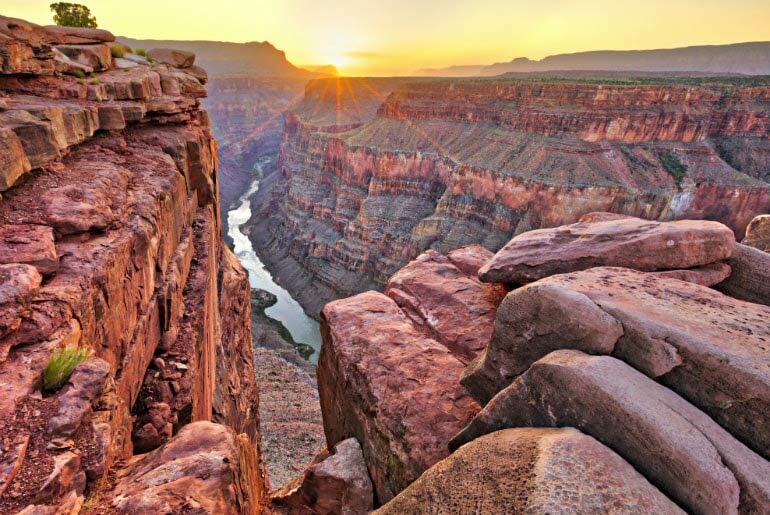 For spectacular sunset views, Lipan Point and Desert View Watchtower can’t be beaten! Alternatively, join a tour onto Native American lands and experience the Western Rim. The famous Skywalk protrudes in a horseshoe out over the rim of the canyon and offers visitors 360 degree views, including through the glass floor! Insider’s Tip: Seeing this impressive site from the ground is a must, but a helicopter tour out over the rim will leave you spellbound and with a whole new appreciation for its size and wonder! Afterwards, take in the sunset over the Grand Canyon from your room at El Tovar Hotel with a drink in hand. 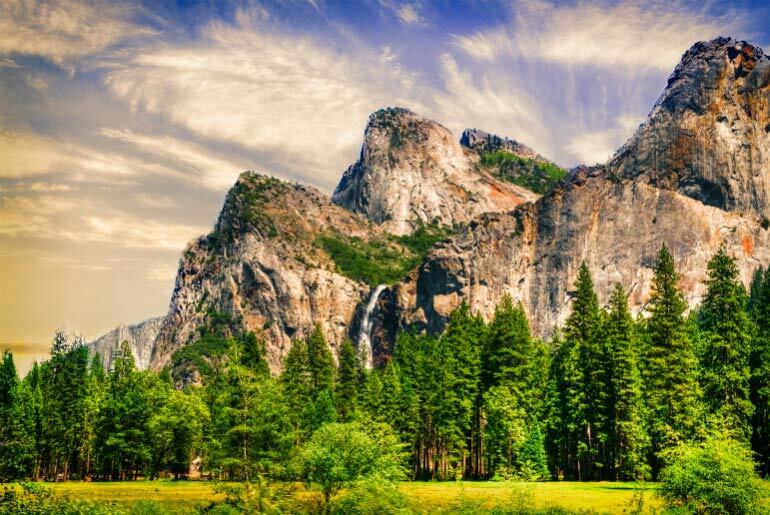 Located in California’s Sierra Nevada Mountains, Yosemite National Park is teeming with wildlife, including black bears and mountain lions to keep your eye out for, while viewing one of the country’s best natural landscapes. With the highest waterfall in North America (Yosemite Falls), the tallest uninterrupted granite monolith in the world (El Capitan), and the glacier eroded face of the famous Half Dome. The Merced River winding through Yosemite Valley creates lush and verdant vegetation, while the alpine meadows of the Tioga Pass are stunning too. At the southern end of the mountain range, Sequoia National Park allows visitors the opportunity to feel insignificant by walking amongst the world’s largest trees. “General Sherman” stands at 275 feet tall and 60 feet wide making it the largest tree by volume in the world, but the national park also has 4 others that rank in the top 10! Insider’s Tip: The view of Yosemite from the valley floor will leave you speechless, but for the perfect photos head to Tunnel View and then on to Glacier Point where you come eye-to-eye with the majesty of Half Dome! With 40 glaciers pouring out from the immense Harding Icefield, Kenai Fjords National Park shows visitors how something as simple as frozen water can carve mountains.  Best reached by boat tour from near Anchorage, the land features bears, wolves, and lynx, but the highlights are often under the waves with humpback whales, orcas, harbour seals, sea otters and Steller sea lions all calling this coastline home at different times of the year. Glacier National Park, best seen from a cruise ship’s deck, is a highlight of Alaska’s Inside Passage and is classed a UNESCO World Heritage Site. With rugged mountains, dynamic glaciers, temperate rainforest, wild coastlines, and deep sheltered fjords, it is home to all manner of land, marine and bird life. With icebergs surrounding the vessel, keep the camera at the ready as you never know what you will see in this wild and remote corner of the world. 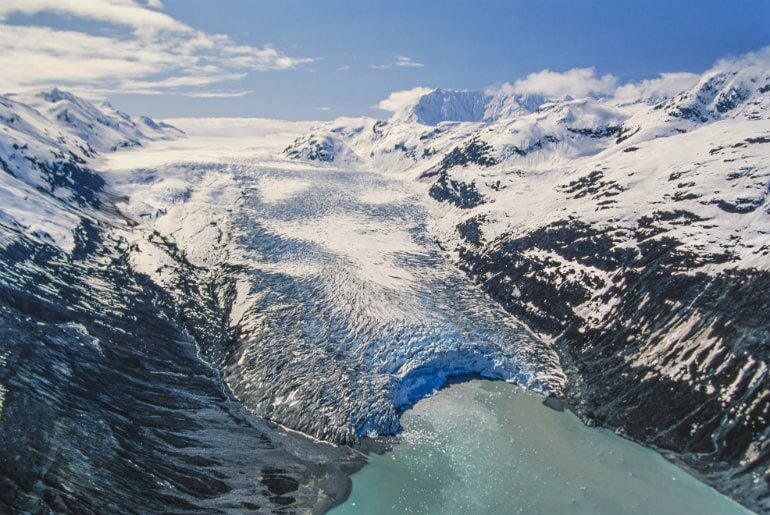 Insider’s Tip: The best examples of glaciers calving into the ocean can be found in these national parks, especially Aialik Glacier in Kenai Fjords National Park. The Big Island of Hawaii contains one of the most active areas in the world with two active volcanoes within the boundaries of Hawai’i Volcanoes National Park. Covering 500 square miles, the park continues to grow in size because the land mass gets bigger as lava flows into the ocean.  The park service gives daily updates of where the lava is flowing but these are unfortunately not able to be reached sometimes. Insider’s Tip: Regardless of whether a lava flow can be viewed, a drive along Crater Rim Drive will give spectacular views of Kilauea, often seen belching gases into the air. 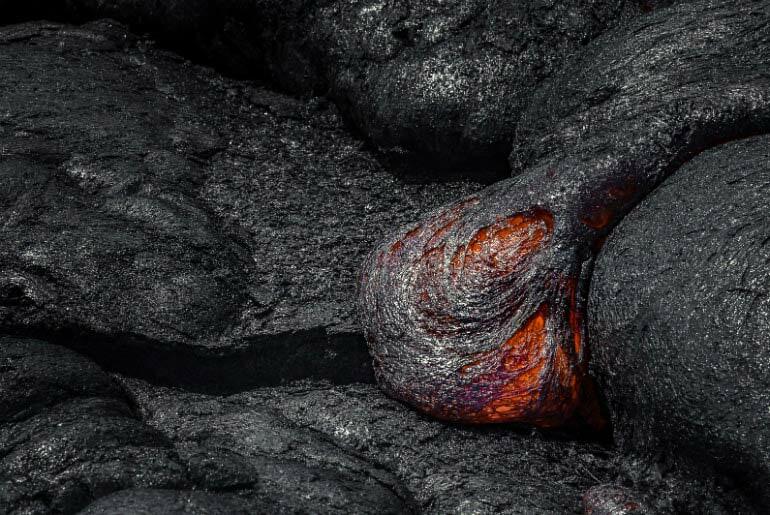 The road also passes sulphur banks, lava tubes and the very active Halema’uma’u crater. The famous surface lava flows about 12 miles east, at the end of Chain of Craters Road.